And if you’ve liked what you’ve read, please feel free to write up your own review of The Silver Cord on Amazon here. Not only is The Silver Cord on Amazon but in select independent bookstores across the US, Canada, United Kingdom, Australia, and India! We’re thrilled that it’s in some of our favorite bay area bookstores like Kepler’s, Dark Carnival Bookstore, and Alexander’s. And it can be found at ground zero of comic book geekdom — Forbidden Planet in Manhattan, NY — not only there, but the MoMA NY bookstore picked up several copies! From GEEK to ELITE! For those who are interested in the location nearest you, we’ve listed all the stores which should have books available here. What’s next for The Silver Cord? Will there be more volumes? That’s entirely up to the fan response. It will be interesting to see what happens next. We’ll find out in time. But either way, we are so thankful that we have had fans like you to help get us this far! As you know from our last update, the Silver Cord graphic novels arrived at the shipping warehouse and were then trucked over to KK’s studio. The process of unpackaging, unwrapping and then individually enveloping and repacking the copies for shipping has already begun. In fact, we have sent out the first batch on Saturday! This process will continue through this week and beyond. This massive logistical operation was a coordinated effort by Steve, Kevin, Claudia, Camille and some very much appreciated help by Kevin’s son Tywen Kelly. We are slightly weary but immensely satisfied that we are finally sending these babies off to all our eagerly awaiting fans. The last few days have been a blur, but we took a break to capture a two-part video of this small historic event for us to look back on, and for you to enjoy in this short wait. They can be watched below. And thanks again for all your support and patience. The payoff is on its way! 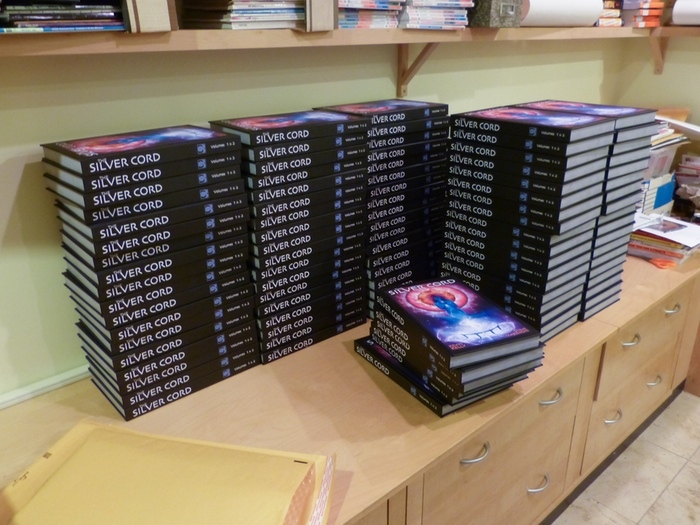 The Silver Cord graphic novels have arrived for our Kickstarter backers! We will begin the process of unpacking and sending them to you this weekend!! Stay tuned for a more detailed announcement in the next several days! We rented a large 24-foot truck to haul the books to Kevin’s studio, unload the 5 tons by hand, and dolly’d them into the room where they are now staged to be packed, labeled and shipped to the post office. We’ve already started the process with the first signed copies. The signed pages are so cool. HOLIDAY ANNOUNCEMENT: THE SILVER CORD UNWRAPPED! Great news! This week we finally received a couple of advanced copies of our super-duper graphic novel that were fedex’d from the printers in Hong Kong. For the record, we filmed the moment when we unwrapped and inspected them for the first time, which you can watch yourself. Our conclusion is that the finished books are absolutely STUNNING! The printing is world-class. The craftsmanship is outstanding. It has sewn rather than glued bindings. This is a well-made book in old-school heritage quality. This book is a joy to hold and will last a long time. As we reveal in the video, we’ve add some bonuses to the project you funded. First, in addition to the second half of the story, the book you will be receiving will include both Volume 1 and Volume 2. Although we only promised Volume 2, we found a way to include Volume 1 as well, so you’ll get the complete story all in one huge book. You’ll be able to start at the beginning and read all the way to the amazing end, which is great for those who may know nothing of the story. And the book is huge. The final book is 464 oversized pages. It is a hardcover that weighs 5 pounds! Don’t drop it ‘cause it would break your toe. It is larger than some encyclopedias. Every page in glorious color. Secondly, it hides an awesome 6-page fold out that stretches out as far as your arms can reach. Some folks might be tempted to cut this 2-yard-wide painting out and frame it as its own artwork. We know of no other graphic novel, or even another book with this scale of a fold-out. It took us weeks to figure out a way to print and bind it technically. It adds another cool dimension to this unique book. Plus, we included a special making of the Silver Cord section and creator biographies in the back of the book, which we think you’ll enjoy. That’s the good news. The bad news is that it won’t arrive in your mailbox till after Christmas. We tried mighty hard (lots of all-nighters) to get this done in time for the holidays, but together with delays at the printer, year-end congestion in the shipping ports, and our own ambition to get it right, we missed this obvious sweet date. The shippers tell us we can expect books at the warehouse mid-January, which means that once we unpack them, and repack them into envelopes for you, and the Post Office does their thing, you’ll have them in your hands by the end of January. It’s a bummer because once we saw this book, our foremost thought was “we need to share this with our friends right now!” Can’t we somehow get them to them? Alas, the books are in the middle of the Pacific Ocean. But they will be in your hands soon, as a wonderful treat to start the new year. Once you have your copy, if you agree with us about its beauty and story, please share your enthusiasm. We have our channels on social media. Extra copies will be available on Amazon. Because there was only a limited number additional copies printed, we recommend you order extra copies now, because no more will be printed. Advance copies can be ordered here. A limited number will also be available in independent bookstores. It was a semi-overcast Friday, some weeks back in late-September when I pulled up to Kevin Kelly’s Pacifica, CA studio. I had made this drive countless times before. But on that day, the drive seemed different. It wasn’t the weather. For me, this was an end of a long, long journey. A journey that had its inception 11 years before. Along the way, this adventure took some unforeseen turns and encountered some near-death obstacles on its path. But this long journey was now near it’s end. The Silver Cord graphic novel was almost complete. The final pages had just been lettered. We were ready for the final push. Walking up to Kevin’s office door, I took a deep breath. This was going to be a mammoth editorial session. Kevin and I planned one long session to review the entire book — all 464 pages. We needed to sieve through it, find any errors to correct. But more importantly, it was our final opportunity to ‘plus’ this book out. What that meant for us was that we weren’t going to stop until we’d completed every page. Now that they were drawn, colored, lettered — did the panels make sense to someone seeing them for the first time? Do we need to add more words? Remove some? Do we need to tweak the art or add new panels to clarify the story? We wanted to make sure that the legibility was maximized for the reader. We devoted so much time to this over the years, and traveled so far to reach this point, that there was no way that we weren’t going to give this that attention now, even though it added yet more time to the process. To ignore it would have been to miss one of the greater opportunities in this process. We hunkered down. We didn’t really move for the next 10 hours. We pressed, prodded and pricked the book. It pressed back. It told us what it needed. It spoke. We took copious detailed notes: The list consisted of many corrections in dialogue, many redo’s in the pencil and inks for some panels, even some that needed to be redrawn. At the end of the day we had nearly a hundred pages we needed to touch for various, but meaningful reasons. I have to say, it was a bit psychologically taxing. I mean, there was some pressure to avoid this process. After all, we were behind in our promised delivery date. We could have delivered the book “as is” and most fans would have been happy. But we wouldn’t. But 100 pages! After 11 years of striving on this project, fatigue had settled in. It was like that point in the running of a long marathon, where your lungs — where every muscle in your body — is screaming at your mind to stop. But we were so close. We needed to finish strong. That’s when the real final push began. Along with key production support in California from Kevin Kelly’s current research assistant, Claudia Lamar, and some last minute aid from his former assistant, Camille Cloutier Hartsell, we were all set to begin the end. Mike Malbrough gets his game face on for the final push. Seta concentrates on coloring an important moment that takes place inside Mission Dolores. Tim Yates makes some additional tweaks involving the hackers in Dolores Park and Tasi in a tense situation. Lucas Urrutia, Gaston’s manager at Stone Tower Studio, is on the phone relating some key art direction from Steve for a key scene. Gaston Zubeldia on his WACOM adding some extra TLC on Black Flame. Luke Easter, letterer extraordinaire, working at his tricked out coffee shop office. Located on just about every other street corner in the US. Claudia Lamar, our trusted and stalwart production manager, formatting some of the last pages to this mammoth graphic novel. Camille Cloutier Hartsell, our production manager on the first book, was briefly called out of retirement to aid on some last minute particulars and her beautiful daughter Hattie adds a little help as well. Steve making sure that the cut and fold marks to the front and back covers are accurate to the millimeter. Kevin finishing up the team biographies and special “making-of” sections of the book. While Kevin circled back and did another pass on word-smithing, I managed, not only the command center, but also to provided off-the-bench assistance with lettering, graphic elements, and coloring some key panels. This process was repeated several times daily. It was over a solid week of none-stop concentration — not just for me, but for the entire team. (Oh, yes, I do have a full time job as well!) At one point, near the end, I went 4 days with only 4 hours of sleep. It was brutal, but necessary. But I was energized because I knew that I wasn’t the only one taxed with sleep deprivation — the other team members were in the same state of being as I was. That fueled me. Everything was moving to the vortex of final delivery. Even members of the team for Volume 1 were busy. Joe Harris (colorist from Utah), Tom Kraky (letterer from California), and Rafael Rivera (colorist from Alabama) were busy signing the 250+ autographed sheets. Rafael Rivera, one of the several team members, signs his autograph and personal individualized doodle (250 unique ones to be exact) to the signature pages that will be attached to a select batch of books for some of our backers. Coordinating an orchestra of artists to create a specific visual ‘sound’ for the book involved waves of uploads and downloads, more waves of emails, instant messaging and phone calls. Like a symphony, the song was all leading to a climax. The difference in the analogy, though, was that all of us were not in the same room. We were dispersed in separate places on the earth. I want to take a moment and tip my hat to the internet and the wonders of digital technology. I originally worked as professional comic artist decades before digital tools revolutionized the medium. Doing what we did just now would not have been possible then. The printed, physical book that you will (very soon!) hold in your hands is a physical manifestation of a intangible logos. It was produced by a hive-mind of living tissue and blood plasma and gray matter transferred into invisible digital codes. These codes then traveled thousands of miles to conjure up liquid dyes on moistened wood, rag fibers, and cellulose pulp. The will of human minds have been digitized and transformed into a physical object. Not a new revelation in 2014 by any means. But, dang, it’s still pretty amazing when you really ponder it. And so, now all that’s left is a short wait. Soon, the ship will arrive from Hong Kong with a ton of boxes packed with solid goods: a world-class printed, 460+ page, full-colored, over-sized hardcover mammoth of a graphic novel, funded by fans, created with love, and our gift to the world — The Silver Cord. Please follow us now on Twitter for the latest updates. We received the color proofs from the printer in Hong Kong over the weekend and we are immensely excited! They look simply amazing! We got so excited, we felt compelled to share some snapshots of them so you can see their scale. The pictures don’t really do them justice. There’s nothing like the tactile experience of touching the pages, holding and allowing your eyes to scan and focus on all the rich color and details. The book will truly be a visual feast. The final pages will be six sigma nearly-perfect quality. And we couldn’t be more satisfied. It means you’ll receive about the best printed book possible. We’d like to emphasize again that the book will be oversized. To show that we’ve included a ruler in some of the pics for scale. At nearly 14 inches tall and almost 18 inches fully open, It’s a very visceral experience; the book was designed to immerse you into the visual story telling. And it does. In an early preview of the script, one PIXAR screen writer called it a page turner — and that was without the pictures! This spectacle of scale demands some long hauls, so we still have a bunch of work to complete. Seeing the proofs we just can’t wait to get all this in front of your eyes…. Hi all, Steve Masseroni here. It’s been a while since our last update. Because of your great support we are progressing nicely and are still on schedule to have the Silver Cord Book 2 done by early summer. Let me just say that we’ll be delivering something incredibly special. I’m uber excited about the story, where it takes us and where it leaves us. And the art? If you thought the first book looked great, then all I can say is wait to you see what we have prepared for you in book two. We are in that stage of the project were the garage doors are shut to the world, but we want to invite you into a quick peek of what is happening inside the studio. Without revealing any spoilers, we selected several panels that show off the incredible craftsmanship this book is infused with. We also want to introduce some details regarding our three new team members: Casey, Mike & Gaston. They are giving this book their best work and it shows. There is so much to say about them, and so little time, so I decided to interview them to get to the heart of the matter. Read their interviews below. I can’t wait for you to enjoy the rest of what we’ve seen so far. We hope the glimpses below get you excited! Casey, What got you into writing? It was something I did without really thinking about it. As I kid I wrote song lyrics, homemade comic books and satirical radio programs just for fun. When I first considered it as a profession I wanted to be a sports reporter. Then it was music reviewer. Then I learned not to limit myself. How did you come across the Silver Cord project? Working on this project, what where some of the challenges? Silver Cord is a very personal view of the entire universe. Someone else came up with it and other writers had turned it into Volume One. I had to be loyal to the characters and trajectories already in place, while being true to myself by shaping the story in a way that resonated with me, applying my voice but keeping it seamless with what came before, and hopefully after. There are a lot of incredibly dynamic characters in Silver Cord, and it was a constant challenge to give them all the attention they deserved. What do you think are some of the more compelling character / story elements? What’s your favorite character and why? You have to relate to Tasi in order for the whole epic adventure to work. It’s a classic journey but Tasi keeps it fresh. Take the mindset of the average teenager, already prone to self-doubt, over-dramatics and the conviction that the world doesn’t understand her, then reveal to her that the fate of the realms is on her shoulders. Realms that she didn’t even know existed the day before. I love the way Tasi handles it. She’s not a super-hero. She’s a normal, albeit, clever young woman given the chance to be fantastic in the purest sense of the word. Honorable mention to Gobi, who gets to have his own peculiar integrity as a robot, then has his innate logic challenged by the arrival of a human soul. Where do you see yourself going with your writing? I didn’t limit myself when I started my career, and I’m not starting now. The good thing is that writers – unlike athletes – can actually get better and more flexible with age. What is your favorite story that you wrote? An unproduced screenplay called Goodnight Earth. It’s a Wizard of Oz styled journey on a post-apocalyptic Earth, as civilization has the chance to rebuild itself and decide what kind of people we want to be. It’s the first screenplay I wrote that I’d want my young daughter to see, and while I’m perfectly aware that I just used the word “apocalyptic” it is hopeful and comedic and pointedly apolitical, and I’m still insanely proud how I managed to pull that off. If anyone wants to read it, let me know. Regarding your career, what would be the ultimate rewarding scenario for you? I recently got some great producers attached to the one-hour television pilot I wrote. In television you’re not only the writer, you’re also the creator, and it’s not just an hour, it’s an entire series you get to play with. Being allowed to assemble a team of hugely talented writers, directors, actors and crew to bring my characters to life would pretty much fit the ultimate career scenario. And I promise I’d be delightful to work with. Casey McCabe is a Bay Area journalist, playwright and screenwriter. His articles and essays have appeared in Mother Jones, The San Francisco Chronicle and The Common. His play “Dreaming of Norton” was awarded Best Stage Scenes of 2004 by Smith and Kraus, and his original screenplays and teleplays have sold to Universal Studios, DreamWorks, and 20th Century Fox. His most recent short story “Electric” was published by Mulholland Books Popcorn Fiction. A native of Lincoln, Nebraska, McCabe currently lives in Marin County, California with his wife and two children. How did you come across the Silver Cord project? What drew you to it? What made it interesting to you? I work as a freelance artist in a studio called Stone Tower Studios. My manager Lucas Urrutia contacted me with the proposition to work on a book, it was a huge project with very talented people working on it. I did a couple of test pages and I really liked the idea of painting something different, robots and angels related in a very cool way. Then I read book one and I got caught up in the story. An awesome story!!! Couldn’t wait to see what’s next! Working on this project, what are some of the challenges? The most challenging thing is painting the angel’s realm, painting beings of light floating around in a space-like environment, with galaxy-like lights and stars in the background. How has the process been? Great, a little slower then usual for me, but I’m very happy with the results. What do you think are some of the more compelling character / story elements? Robots, angels, realms, what’s beyond death — all that mixed in a great story! What’s your favorite character and why? I think that Black Flame is my favorite character; I got a preference for the villains. We all know and understand about making good characters, but creating a bad guy with a complex background could be hard, and even more, making him with convincing motives. Where do you see yourself going with your art? I really don’t know. I like what I do, and that’s all I think about, I live one day at a time, today I work on Silver Cord Book 2, tomorrow we’ll see. You can see Gaston’s art here http://stonetowerstudio.blogspot.com/p/gaston-portfolio.html. It’s what I’ve always done. Since an early age I leaned on painting and drawing to express myself, gain confidence, and ultimately carve out a living. Steve Masseroni reached out to Ten Ton Studios, an online comic art studio of which I’m a cofounder, looking for artists. I jumped at the chance to be involved because I could tell that there was a lot of dedication and heart behind the project. That, and the fact that the story is so original and massive in scope. I’ve found that Silver Cord is really stretching me as a draftsmen. I’m drawing everything from advanced technology to nebulous, otherworldly realms, and right down to bums in dumpsters. And everything has such intention behind it that there is little room to just coast visually. It’s great. I love the challenge. Great. Kevin and Steve are awesome to work with. They have really made it easy for me to focus on the art, and Gaston’s colors really bring the art to life. I look forward to every time he posts something. What do you think are some of the more compelling character / story elements? I enjoy the way the story takes place on two planes of being that are running parallel, and how that effects the pacing of the book. And, like all good science fiction, Silver Cord deals with compelling issues and questions in a thoughtful and entertaining manner. Gobi is my favorite. I love the design of him, and his face is both hauntingly sterile and expressive. I’m just trying to get better everyday and ultimately connect with those that respond to my work both as fans and collaborators. If I can continue to draw and make a living, I am content. But I’d like to build a library of published comic work, and branch off into projects for film and video games as well. So basically if I leave a bunch of junk behind for others I’ll be happy. Mike Malbrough is primarily a sequential artist working out of New Jersey. He co-founded Ten Ton Studios, a community of professional artists whose work has been featured by companies such as Marvel, DC, Top Cow, IDW and others. Mike has the colorist on Zorro Rides Again, by Dynamite Entertainment, and artist on Battle Star Galactica: First Wave for Realm Press. He is also the director of ORNG Ink, a youth arts studio. Mike currently resides in Orange, New Jersey with his wife and two children. You can learn more about Mike here: http://www.tentonstudios.com. Hey, the Silver Cord is shaping up! After a long “heads-down” silence, we are nearing the end of work on the second book of The Silver Cord — a visual techno epic. As the pages fly in, their beauty and brilliance are stunning. We are certain that supporters like yourself will feel that the artists have surpassed the quality of the previous book, which was amazing to begin with. We’ll post some samples here of what you’ll get in the finished book. As a reminder, this graphic novel is about angels and robots, astral travel and quantum computers, other kin and hackerspaces, and whether AIs can be spiritual. The questions have gotten even more relevant since we started. While there is still much to do in preparing the book for printing, we are near enough to the end to have a better sense of a publication date. As of today, the book you supported will mail out in September. That is later than the estimated date we had two years ago when we launched the Kickstarter campaign. There are a couple of reasons for this later date, all of which will make a better book. First thing is we decided to print the book larger. Much larger than we first planned. This is going to be a huge book. It may not fit in your bookshelves! The page size will be 8.5 inches by 13.25 inches — way bigger than 95% of most graphic novels. It’s so large in fact, that no US printer is capable of printing it. So, off to China we had to go. The book will be printed to six sigma quality in Hong Kong, but that long boat ride back added 6 weeks to the delivery date. Second thing is the book will be longer than we first thought. Much longer. You’ll be wowed by the scale of the story we now have. But those extra pages have meant more time in producing it. Third reason is that Silver Cord has been picked up by the indie distributor PGW and Amazon. This was a surprise we had not imagined when we did the Kickstarter campaign. While supporters will be mailed their award copies, the book will also appear later in bookstores and Amazon. It has taken some time to squeeze into their slipstream, but by autumn, your friends and other fans should also be able to get a copy. Meth heads in the rain come upon an unconscious Tasi. We have a couple of other surprises, cool pluses that make this book incredibly special, but they are surprises for you to unwrap, and those too added some time to the production. Now that we are near the end and can look up, we’ll be posting more samples and more background stories on the making of this 10-year epic. Gobi wows the tech execs with his genius. And when we mail the books, we are thinking about having a huge party in the Bay Area. It would be exciting to bring together the diverse mix of supporters for this project. If you have any creative ideas of where/what/how, let us know. What a team! To create the second book of the Silver Cord story, we’ve assembled a fantastic creative team. The script is in its final round of editing, and the artwork has begun. To craft the concluding part of our story we enlisted Casey McCabe who was recommended by a friend at Pixar. Casey had sold a number of screenplays to Hollywood, although none have reached the screen yet. We could offer him a 100% chance of realization in a graphic novel, which is a great attraction for a creative. Casey, Steve and Kevin worked together to produce a script that combines action, emotion, big crazy ideas, and unexpected turns. We think you’ll love it. The chief artist for the book is Michael Malbrough. Mike is a veteran graphic artist. His style is a perfect match with the first book, and he delivers a strong clear look. He’s been busy developing new characters and stunning scenes for this new book. The finished drawn pages will go to Argentina, where colorist Gaston Zubeldia will flesh the lines out in painterly color, again to match the first book. Gaston has worked on a dozen previous graphic novels, and we are delighted he’s working on this one. 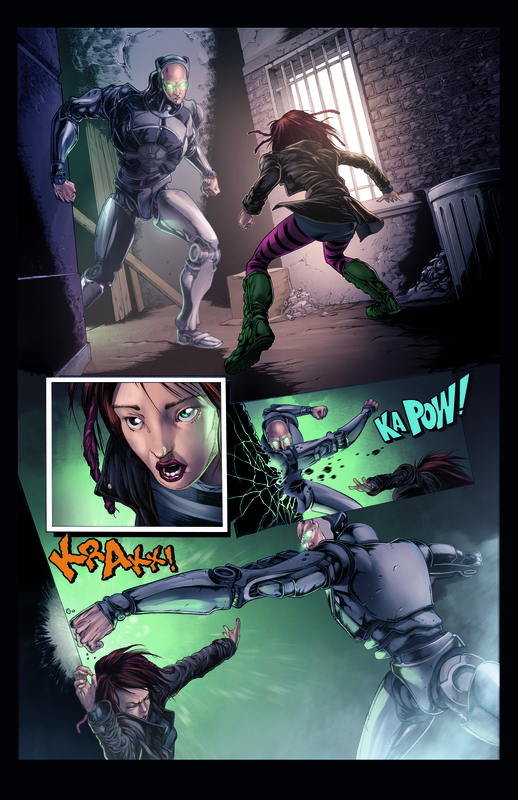 Here is a sample page, drawn by Mike and colored by Gaston, to give you an idea of what is to come. (Larger image here.) We are excited to be on schedule to delivering you a really great experience.